Using the concept of the SIMM (Single Inline Multipurpose Module), the ADDA-2 features four A/D channels plus two D/A channels, both with a resolution of 12 Bit. The module can be used on any microprocessor board providing the local MLX bus-extension. 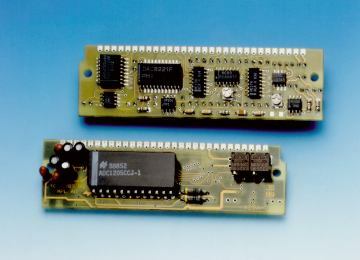 The MLX-bus (MPL local extension) provides an 8-bit synchronous bus and can be used like any microprocessor peripheral. The ADDA-2 features DC/DC converter for single power supply, input-protection of the A/D converter plus voltage output on the D/A section. The dimensions are very small and the connector is an AMP-standard SIMM-connector. The technology used is fully CMOS and low power consumption of only 5V at 18 mA (typ.) is achieved.